All aspiring writers are told to write what they know. Simpsons creator Matt Groening seems to have taken that to heart, at least when it came to naming the characters of the long-running hit animated comedy. Further evidence emerged in a poignant way, in the local newspaper obituary of Groening's mother Margaret. Margaret Ruth Groening, who did not answer to "Marge", died in April at the age of 94. The piece in the Oregonian showed the extent to which Matt drew on his family for Simpsons inspiration. Apart from Margaret herself, Groening's dad was the original Homer, at least in name. In reality he was a respected documentary filmmaker, although Margaret apparently chose Homer "because he made her laugh the most". Margaret did not have two foot high blue hair, but her maiden name was Wiggum, also the name of Springfield's klutz of a police chief. Matt's sisters include a Lisa, Maggie and a Patty. Groening has always admitted he based many aspects of the yellow animated family on his own parents and siblings. Springfield is named after Springfield Oregon. Groening grew up in neighbouring Portland, although the family did live on the original Evergreen Terrace. "I basically drew my own family," he said about the first Simpsons sketches. "I was going to name the main character Matt but I didn't think it would go over well in a pitch meeting so I changed the name to Bart." His father Homer used to record his kids telling stories. 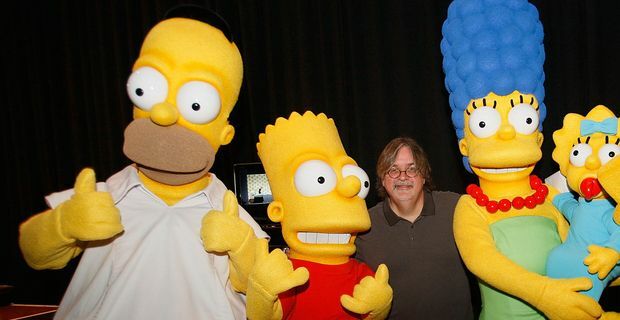 Groening believes that might have provided the spark of inspiration for the autobiographical elements in The Simpsons. "There is an aspect of the psychodynamics of my family in which it makes sense that one of us grew up and made a cartoon out of the family and had it shown all over the world."